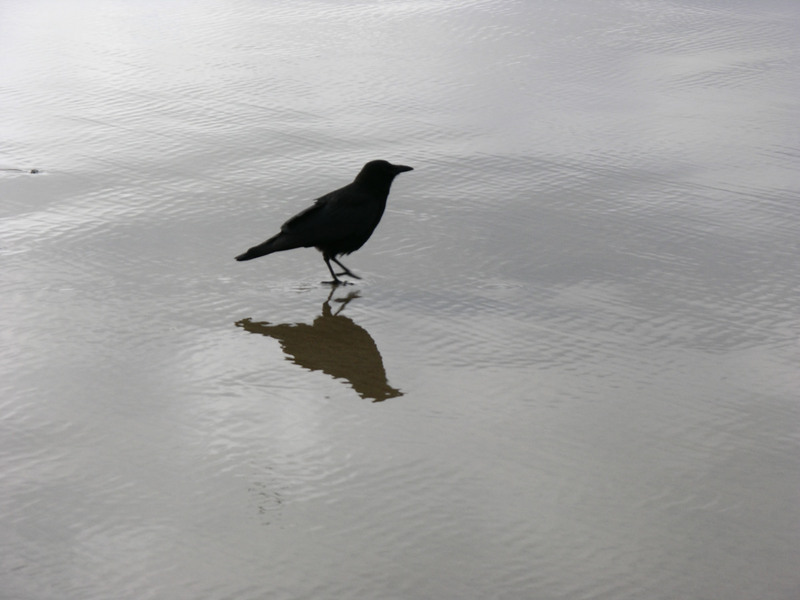 Here in Seattle, the roost of crows is estimated to be in the tens of thousands. Though near some cities, the estimate can be of over a million birds. I never grow tired of it, always in awe. I drove out to the arboretum three times this winter, hoping to see the crows. But darkness came and the crows did not. Finally, a friend told me that the roost had moved. The crows now meet over at the SR 522 / 405 interchange, at UW Bothell. What’s more ominous: the sound of the traffic, or the sound of crows? In my next couple of posts, I’m going to investigate as best as I can why the crows meet like this. But no matter what I find what, one can’t help but be moved by the mystery. How can we ever possibly know why—or all of the why? If you like Mark’s photography, check out his book The Monster of Perugia, The Framing of Amanda Knox. In Buddhism, the Dharmapala (protector of the Dharma) Mahakala is represented by a crow in one of his physical/earthly forms. Avalokiteśvara/Chenrezig, who is reincarnated on Earth as the Dalai Lama, is often closely associated with the crow because it is said that when the first Dalai Lama was born, robbers attacked the family home. The parents fled and were unable to get to the infant Lama in time. When they returned the next morning expecting the worst, they found their home untouched, and a pair of crows were caring for the Dalai Lama. It is believed that crows heralded the birth of the First, Seventh, Eighth, Twelfth, and Fourteenth Lamas, the latter being the current Dalai Lama, Tenzin Gyatso. 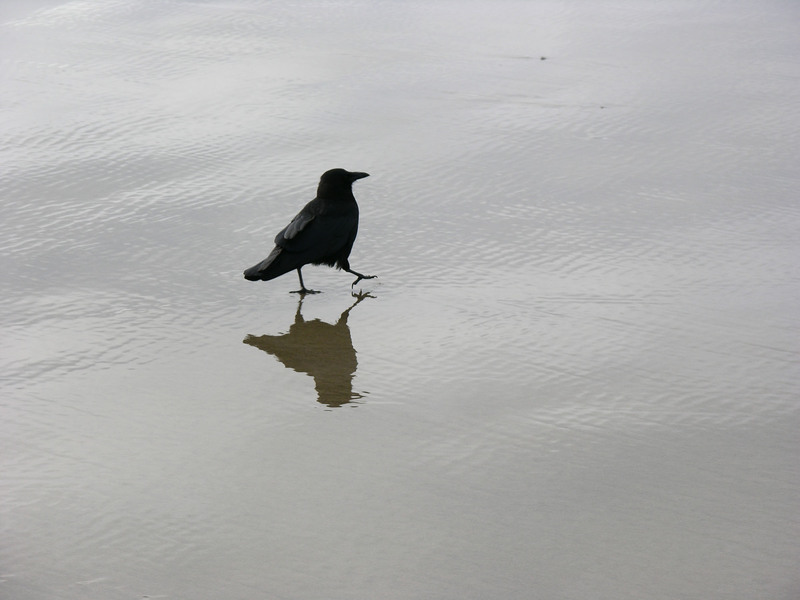 Crows are mentioned often in Buddhism, especially Tibetan disciplines. In Greek mythology, it was believed that when the crows gave bad news to the goddess Athena, she flew into a rage, and cursed their feathers to be black. In Hinduism, it is believed that people who died will take food and offerings through a variety of crows called “Bali kākka.” Every year people whose parents or relatives died will offer food to crows as well as cows on the Shradha day. The poet who sent me this list, a friend from my college days, Ellen Girardeau Kempler, had this to add to the complilation: The aspect of this info. that stood out for me was that there are as many positive associations here as negative–usually only find the negative. And BTW, in Ireland (where I attended a poetry workshop last summer) the common crow is the Hooded Crow, which they call the Grey Crow, a beautiful black and charcoal version–black head and granite chest. They sound and act the same (universallyl crowlike). This video goes well with the following post, because not only do crows use tools to prepare meals, they also use napkins to enhance the dining experience. The following was told to me by Benny the Rock Dancer, a street artist who lives and performs on the street. He knew I had written a book about crows, so he began to pay special attention to the ones that hung out in his neighborhood. Because Benny fed the crows, he said the crows visited him regularly. But, he said, the crows had a sense of the week, and visited him only a weekdays. When I visited him on the more crowded weekends, the crows did not stop by, and so we couldn’t watch them together. One day Benny put a Burrito out for the crows. And the biggest crow, the head bully, would share it with the others, but first he’d take out the best part. He’d take out the meat. Really, he’d savor the best ingredient, eating a little bit of it and then hiding the rest. He’d put the meat beside the sidewalk, in a place where no human would walk on it. Then he’d cover the meat with a bit of a ripped napkin. Really, said Benny. The crow would do this. The crow would cover the meat with a piece of napkin, to protect it when he put the pine needles and other debris on top if it, to further hide it. In this way, his meat wouldn’t get fouled up with dirt and so on. Then he’d let the other crows have at the rest of the burrito, the rice and tortilla and all that.